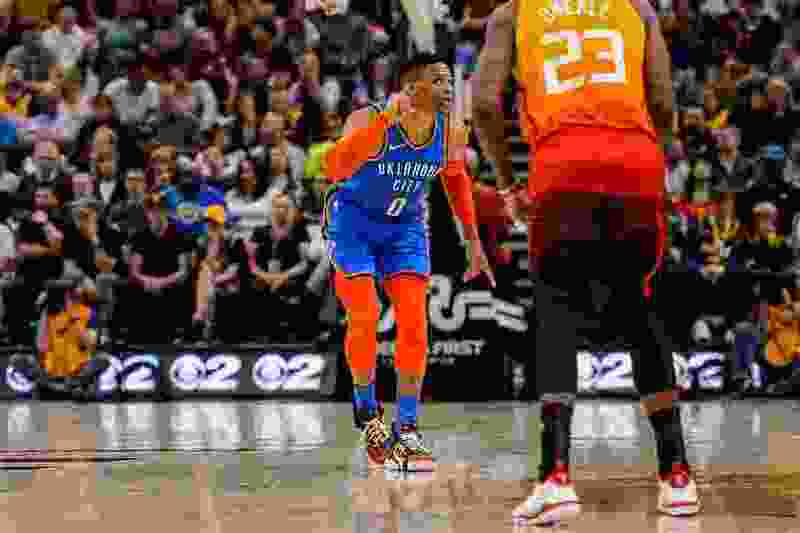 Russell Westbrook and Jazz fans seated next to the Thunder bench were involved in a verbal altercation during Monday’s game at Vivint Smart Home Arena, some of which was caught on video by another fan. "I swear to god, I’ll f--- you up. You and your wife, I’ll f--- you up. Promise you on everything I love, I promise you,” Westbrook says to a fan on the video. “How it started was, a young man and his wife in the stands told me ‘to get down on my knees like you used to.’ To me, that’s just completely disrespectful, to me, I think it’s racial, and I think it’s inappropriate,” Westbrook said. He said that the NBA and its arenas need to do more to curtail fan abuse thrown in the direction of players. “I just think that there’s gotta be something done, there’s gotta be some consequences for those type of people that come to the game just to say and do whatever they want to say. I don’t think it’s fair to the players, not just to me but I don’t think it’s fair to the players,” Westbrook said. KSL-TV interviewed the fan, Shane Keisel, who delivered the barb. Keisel, though, says Westbrook misunderstood what Keisel yelled. Westbrook took no questions from reporters about the incident (or the game), only delivering a 3-minute long statement. “If I had to do it over again, I would say the same exact thing. I truly will stand up for myself and my family and my wife and my mom and my dad every single time, I expect anybody else to do the same,” Westbrook said. Westbrook’s full statement can be found here. This isn’t the first time Westbrook and Utah fans have interacted like this. After Utah’s Game 6 win over Oklahoma City, Westbrook also said he received unfair abuse from fans in Salt Lake City.